I think, by the time, we all are well aware of the importance and benefits of social media marketing for businesses. It is indeed a mandatory tool to be used when attempting marketing of your brand to the mass. However, there are certain notions, that I often get to hear from the people, regarding social media which are not totally valid. I am terming them as ‘misconceptions’. 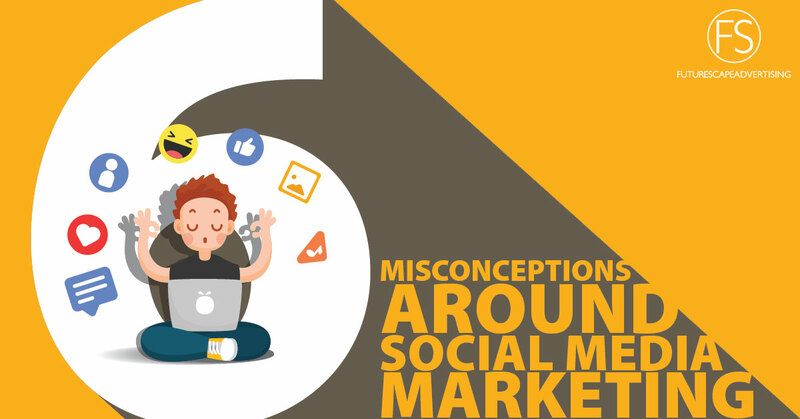 In today’s post, let’s talk about six (out of many others) such misconceptions that are shrouding the idea of social media marketing. The moment we consider social media as our marketing channel, the general tendency is to begin finding out all the platforms available and create a business profile. A month down the time most of the profiles (if not all) stay inactive. This actually does no good to your brand, instead does a little harm in fact. So, what is an effective way to proceed? Instead of searching for available platforms, try searching which are the platforms where your core target group are mostly available and active. Try not to create more than 3-4 business profiles, because it is not only about creating profiles but also maintaining them on a regular basis. For that matter, merely 2 active and updated profiles can benefit a brand more than 4 inconsistent profiles. Well, another common misconception. For the sake of posting, people even begin posting stuff that are remotely related to their brand and practice. The idea is to keep hammering your brand name and logo to people’s mind. Trust me, too much hammer can be very very irritating and actually dilute your main content. The best way is to create a routine for the posts and follow it consistently. Allow pleasant gaps between your posts. See that your posts are not too frequent to jam up, again not too delayed that it almost goes out of memory and each time need to create a fresh impression. Deliver quality content at regular intervals. “My brand provides very limited services/products, how much new stuff can I speak about these few things.” This is a very valid worry as to what to speak so much about one or only a few things. Isn’t there a risk of running out of content after a few months? Well no, because there is no end in creativity. You can always find out creative ways to put forth your brand. Also, we can create posts like awareness, educational that are related to the service and products. You can promote your customers’ feedback and always devise out new ways to promote. Many a time, social media is regarded as a medium only for younger people. And hence businesses whose TG is not young, they tend to ignore social media as a medium for marketing. However, the notion is not right. These days more and more elderly people are making accounts with social media platforms and surprisingly many a time they are spending comparatively more time in social media than the younger people. Therefore social media marketing really has the potential to benefit business with varied target age groups. Well, this cannot be passed as a total misconception, as negative comments may influence your brand image but then it cannot be tagged as “too risky”. Why? Because negative comments actually help you in understanding the glitch areas much faster, which you can address and resolve at the earliest. Coming to the brand image, well expert marketers can turn a negative situation to their benefit very easily. In this case, respond the comment with politeness and accept the flaw (if any) and promise to resolve it faster. Responding negativity with politeness pulls up your brand’s humbleness. Then don’t forget to address the problem. Once resolved to see that you respond the comment saying it’s done and thank the person to bring out the flaw at the earliest. You may also offer them a discount voucher if possible. This will portray your brand as customer-centric and always ready to improve services. Yes, creating a social media account is free. Also making posts are also free. However promotion is not entirely free. To reap maximum or for that matter considerable benefit from social media, a post need to reach the maximum audience and that too to the right target group. To ensure the same, businesses need to promote their brand pages and make sure that it reaches the right category and number of people. Social media marketing tools help you addressing this demographic and geographic specifications, but they do come for a price. Therefore, in case you are considering social media as a marketing vehicle for your business, do set out a budget to use the medium to the full benefit. Hope you will find our article helpful. We will be back with some other interesting topic. Stay tight to the space.